24 Easy Ways To Turn Your PATIO Into A Private OASIS. Let's face it. When we come home after a long day of work, we like to Netflix and chill, and we usually do it on our bed or sofa, underneath our favorite blanket. But summer's just around the corner, and it would be a shame to waste that beautiful sunlight. We don't necessarily have to wander far, we can enjoy it from the comfort of our own homes. The thing is that most of our patios and balconies aren't places we want to be. They're dusty and definitely not as cozy. Some of us even forget we have them. Below you'll find some decorating tips to create your dream balcony or patio this year, and despite what you may think, most of them won't cost you an arm and a leg! Mix and match according to your vision and budget. #1. Drape a sheer canopy for a fairytale romance theme. #2. For a more affordable version of this look, purchase or make your own papasan and add some matching decor. You'll feel like you're on vacation. #3. Look like a gardening pro with a terraced garden like Susann Lorsson's of Purple Area. Plant herbs and harvest often for upkeep. #4. This balcony folding table is the coolest thing since sliced bread. Why don't apartments come with this? #5. Want a comfy chair and a practical dining area? 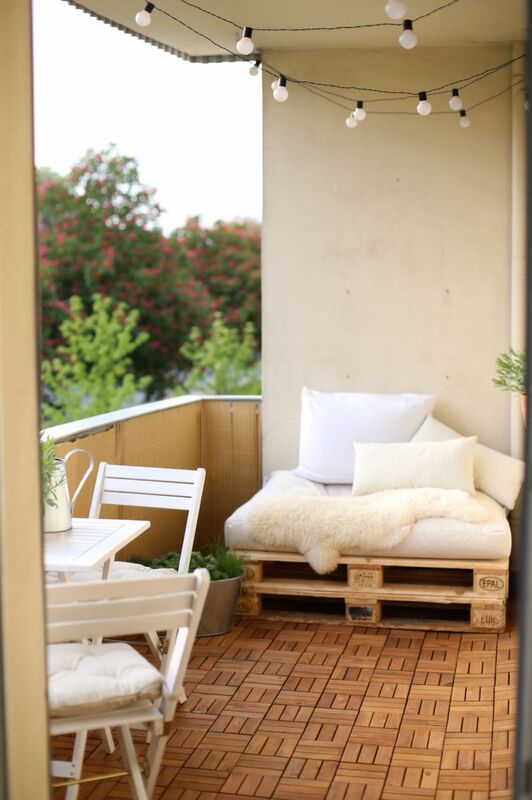 Save space and money by using wooden pallets as a platform.